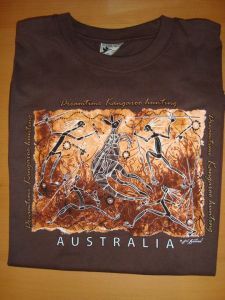 To celebrate the release of In Quest of Theta Magic in Kindle format, I’m delighted to give out a lovely T-shirt from Australia with Aboriginal artwork (dark brown XL) for one of the readers. All you have to do is twitter about the novel In Quest of Theta Magic or my website SteamyDarcy AND leave a comment below of your favourite beastly look-alike hero. Competition closes on 30 June and it is open to Night Owl Romance’s subscribers only. When Dean Williams saw Elana Bailey walk toward him in the center of the ceremonial ring, his heart stopped beating for a second. She was breathtaking, wearing a lacy gown of pastel green, fastened at her right shoulder with a magnificent white sunflower. Her left shoulder and most of her left breast were exposed. The neckline was shaped in tiny waves, drawing his attention to her cleavage and creamy mounds that framed it. The gown hugged her body, emphasizing its lush hills and valleys. The skirt was accented by a high slit that reached nearly to the top of her right thigh. The long train spread out in a bell shape, elegantly arrayed behind her. She didn’t wear any of the jewelry I gave her. She’s wearing her own necklace, with the garnet cross. Defying woman! But the white sunflower looks superb. Where did she come by such a rare color? It symbolizes purity and loyalty. So she will pledge her innocence and loyalty to me forever? Williams watched with wary disdain as the woman actually approached him. “You really are the same Mr. Williams?” Mrs. Bailey walked near him and demanded. The temptation was too great. “You miss my ulcers?” Williams asked softly, and then controlled his muscles to make some swellings appear on his face. Mrs. Bailey screamed out loud and ran back to Lara. Williams relaxed the muscles, and the lumps were gone before any one in the town center could catch a glimpse of them. No one could understand why Mrs. Bailey was screaming. Elana saw his naughty prank on her mother, and she couldn’t help laughing out loud. When her uncle placed her hand in Williams’s, she was still chuckling, and the movements made Williams even more aware of her breasts. This woman, he realized, was seriously disturbing his balance. Elana’s eyes widened and her mouth gaped open. When she saw the satisfied twinkle in his eye, she whispered, “Insufferable man!” And then the betrothal ceremony began. Well, how do you like this shapeshifting beast who can control and relax his muscles as he wishes? The above excerpt is from my novel In Quest of Theta Magic which is recently available in Kindle format. Night Owl Romance’s lovely Arianne has given the novel a Reviewer’s Top Pick. I would like to thank Arianne for the review and Tammie for hosting me today.